Just wanted to share a few pictures of the Originals-By-Kay Silk corset that I recently purchased on ebay. 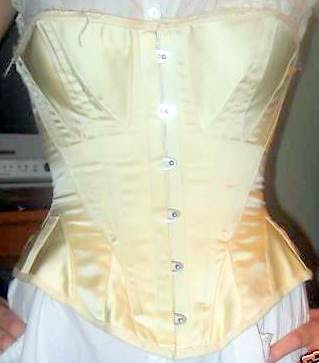 The corset I've used for 1860s Reenacting for the past few years was made by Beth Miller Hall of Gettysburg. Her craftsmanship is beautiful, but it has seen better days. I had hoped to remedy that by purchasing this corset on ebay, but alas, it does not fit my long waisted body as perfectly as I had hoped. I guess I'll be making a corset after all. Hopefully this corset will find a home with my mother. I'd like to make a pattern from my Beth Miller corset since it fits so perfectly. Thought you might just like a peek at this very beautiful corset. Kay Gnagey of Originals-By-Kay also made the corset for the movie 'Owl Creek Bridge' which is one of the short films featured in 'Ambrose Bierce: Civil War Stories'. She did such an excellent job on all of the costumes. I particularly fell in love with this corset and have wanted to make a silk corset since. For now, I suppose it will have to remain on my to-do list. Thank you for posting the link to the Ambrose Bierce movie. Back when I was in high school and working with Kay in her sutlery, knew she had done the costuming for Owl Creek Bridge but never was able to find the movie itself. I didn't realize it was just one part of the Civil War Stories, and had been searching for the wrong thing. I fell in love with a dress she had displayed on her site done for the movie, it was a cotton plaid done in a late 50's style I believe, and the cotton was so nice it had the appearence of silk. I've always wanted to see in in the film. What a lovely corset! It such a shame that it doesn't fit you ; ( Thanks for linking to Owl Creek Bridge, I've wanted to see that movie for a long time. Gorgeous corset, indeed! I'm sorry the one you purchased did not fit exactly as you had hoped. I'm having similar corset troubles as my new one, for some reason, causes me pain around my waist when I wear it (It didn't do this the first few times I wore it). I have been thinking about getting a kay corset but think I should wait til after the baby is weaned.